This product is customized for use throughout Europe, except in UK and Ireland. With the latest firmware installed, you will be able to turn off the router's wireless signal altogether at certain times of the day, to save energy and use the USB port to share a printer or a memory stick on the network (SharePort). 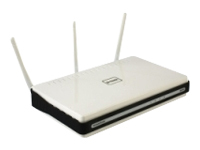 The DIR-655 Wireless N Gigabit Router connects to any modem or ISP box to provide Internet access for computers and other network equipment. It is an advanced device that features 802.11n (Draft 2.0) technology, thus incorporating 300 Mbps wireless performance with extended coverage and no dead spots. Gigabit Ethernet connectivity is included on both LAN and WAN networks. This router, with its Quality of Service feature, automatically detects if audio, video or gaming content is being transmitted over the network and gives these applications priority over less time-sensitive traffic such as email or file transfers. Setting the router up is easy even for non-technically minded people, with D-Link Click'n Connect: run directly from the product CD-ROM, this wizard takes you through an interactive step-by-step guide that will get you on-line in a matter of minutes. It also includes a simplified method of setting up wireless encryption, the WiFi Wireless Protect Setup (WPS), which works at the touch of a button. A powerful dual firewall (SPI and NAT) prevents Denial of Service (Dos) attacks and attempts to breach your network from the Internet. You can also define a list of allowed sites to restrict web access during certain periods.